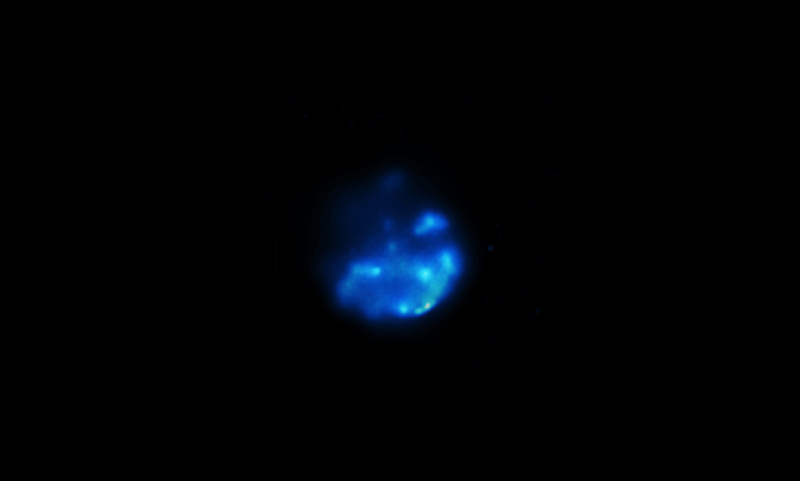 Scientists used Chandra to follow up with the initial discovery, learning more about the remnant's properties. This supernova remnant, dubbed G306.3-0.9, is located about 26,000 light years from Earth. While performing an extensive X-ray survey of our galaxy's central regions, NASA's Swift satellite has uncovered the previously unknown remains of a shattered star. Designated G306.3-0.9 after the coordinates of its sky position, the new object ranks among the youngest-known supernova remnants in our Milky Way galaxy. Astronomers have previously cataloged more than 300 supernova remnants in the Galaxy. The new analysis indicates that G306.3-0.9 is likely less than 2,500 years old, making it one of the 20 youngest remnants identified. This composite of supernova remnant G306.3-0.9 merges Chandra X-ray observations (blue), infrared data acquired by the Spitzer Space Telescope (red and cyan) and radio observations (purple) from the Australia Telescope Compact Array. The image is 20 arcminutes across, which corresponds to 150 light-years at the remnant's estimated distance. Astronomers estimate that a supernova explosion occurs once or twice a century in the Milky Way. The expanding blast wave and hot stellar debris slowly dissipate over hundreds of thousands of years, eventually mixing with and becoming indistinguishable from interstellar gas. Like fresh evidence at a crime scene, young supernova remnants give astronomers the best opportunity for understanding the nature of the original star and the details of its demise. Supernova remnants emit energy across the electromagnetic spectrum, from radio to gamma rays, and important clues can be found in each energy band. X-ray observations figure prominently in revealing the motion of the expanding debris, its chemical content, and its interaction with the interstellar environment, but supernova remnants fade out in X-ray light after about 10,000 years. Indeed, only half of those known in the Milky Way galaxy have been detected in X-rays at all. The Swift Galactic Plane Survey is a project to image a two-degree-wide strip along the Milky Way's central plane at X-ray and ultraviolet energies at the same time. Imaging began in 2011 and is expected to complete this summer. The Swift survey leverages infrared imaging previously compiled by NASA's Spitzer Space Telescope and extends it into higher energies. The infrared and X-ray surveys complement each other because light at these energies penetrates dust clouds in the galactic plane, while the ultraviolet survey of the region is the first one ever done. On Feb. 22, 2011, Swift imaged a survey field near the southern border of the constellation Centaurus. Although nothing unusual appeared in the ultraviolet exposure, the X-ray image revealed an extended, semi-circular source reminiscent of a supernova remnant. A search of archival data revealed counterparts in Spitzer infrared imagery and in radio data from the Molonglo Observatory Synthesis Telescope in Australia. To further investigate the object, the team followed up with an 83-minute exposure using NASA's Chandra X-ray Observatory and additional radio observations from the Australia Telescope Compact Array. Using an estimated distance of 26,000 light-years for G306.3-0.9, the scientists determined that the explosion's shock wave is racing through space at about 1.5 million mph (2.4 million km/h). The Chandra observations reveal the presence of iron, neon, silicon and sulfur at temperatures exceeding 50 million degrees F (28 million C), a reminder not only of the energies involved but of the role supernovas play in seeding the galaxy with heavy elements produced in the hearts of massive stars. A paper describing the team's findings will appear in an upcoming edition of The Astrophysical Journal and was published online on Friday. Coordinates (J2000) RA 13h 21m 51.00s | Dec -63° 33´ 54.00"
Very impressive images, specially the wide field image! Thanks for posting. However, I'm confused by the speed differences: while Kepler's sn remnants are said to move at 11 mio km p h (after thousand years) this one is much slower (2.5 mio k p h) after 2.5 thousand years. I don't think the speed slows down that strong. Maybe, the sn-types are different? In reply to Billy, we are seeing this remnant as it was 26000 years ago - the time it has taken for its light to reach us. When this light left the remnant it was 2500 years old hence it's total actual age is 28500 years. I really like the Infrared image. Always mind boggling to see this extraordinary things occur in the Universe. It leave me in complete, unabashed AWE! I'm not really professional, and just learning. So I would say thanks. If it's only 2500 years old, but the distance is over 26,000 ly's away... how do we see it? 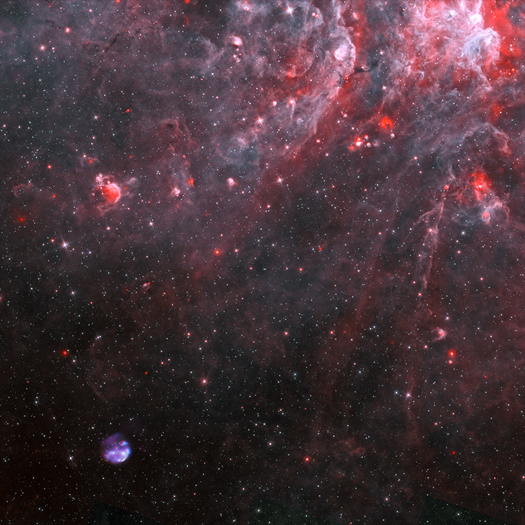 A supernova remnant in the Milky Way is among the youngest known. 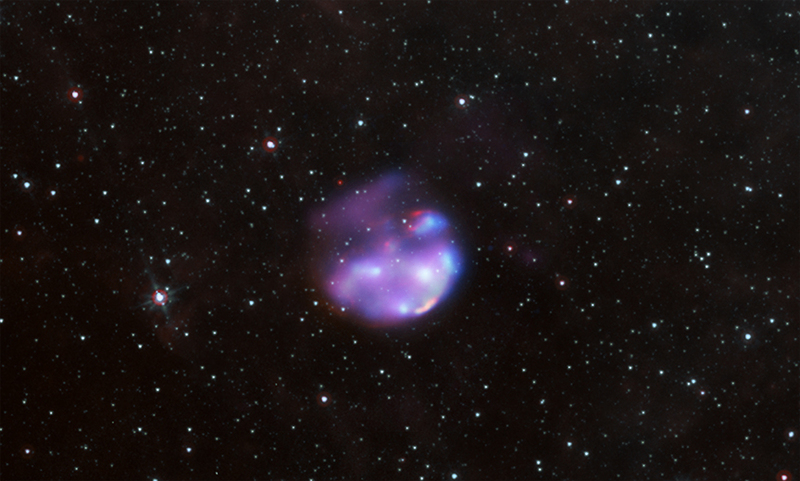 Combines X-rays from Chandra X-ray Observatory, infrared data from Spitzer Space Telescope, and radio data from the Australia Telescope Compact Array. About 150 light years across. X-rays are blue, infrared red and cyan and radio purple. In the constellation Centaurus in the Southern Hemisphere.